“Hellooo,” Bert’s voice rang out from the front door. pot on the stove waiting for curds to form. Bert is an old family friend—old in both senses but don’t tell Bert I said that. She’s as thin as a whip and has more energy than someone half her age. “What’s that you’re cooking,” Bert said, peering into the pot bubbling on the stove. Bert put her purse down on a kitchen chair. She was wearing a pair of jeans with an elastic waist and a sweatshirt that said Grandchildren are God’s gift. “So, how’s your love life,” she said. I sighed. Bert viewed herself as some sort of geriatric Cupid. My neighbor Jake, who Bert has termed hot, has made it pretty clear he’d be happy to take me out for a meal, and Bert is viewing that as just this side of a marriage proposal. Matt, who owns the Lovett General Store, also seems to enjoy talking to me when I go in, and Bert thinks that’s a sure sign of his enormous interest in me. Frank is my late husband’s brother and looks so much like Bill that it confuses me. I can’t tell whether I might be in love with him or whether I am just confusing him with Bill. In any case, I’m in no hurry to make any decisions regarding my love life. I’m very happy with my life here on Love Blossom Farm, and I’m managing just fine. How about you? How is your love life? COMING ON JULY 4! PRE-ORDER YOUR COPY NOW! I'M GIVING AWAY ONE COPY TO SOMEONE WHO LEAVES A COMMENT BELOW! The county fair is the highlight of the year for the small town of Lovett, Michigan—especially for food-and-lifestyle blogger Shelby McDonald, who writes as the Farmer’s Daughter. She’s submitting jams and jellies she’s created from the produce she grows at Love Blossom Farm in hopes of harvesting a blue ribbon. 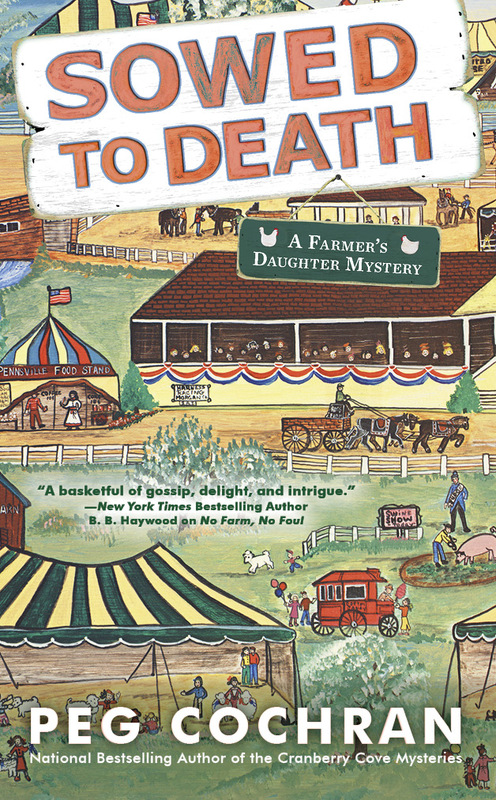 But the townspeople get more than just the excitement of hayrides, tractor pulls, and cotton candy when Shelby’s neighbor and volunteer fireman, Jake Taylor, extricates the body of Zeke Barnstable instead of a dummy during a demonstration of the Jaws of Life. The fact that Jake and Zeke were known to be at odds plants suspicion in the minds of the police. 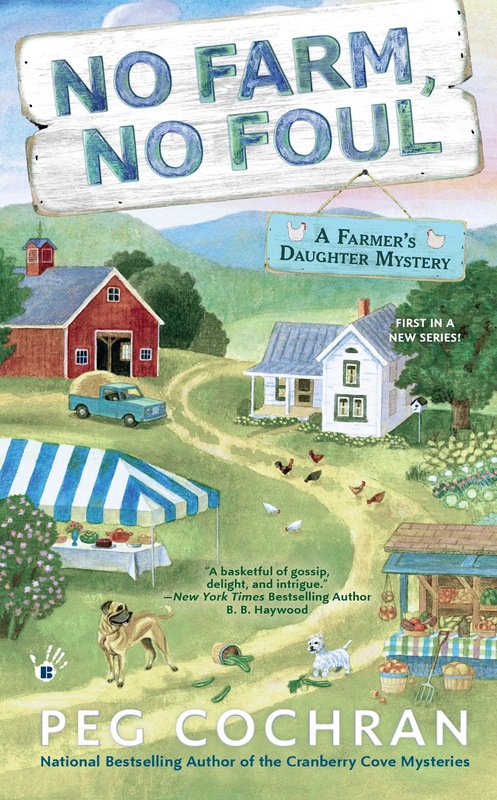 As evidence against Jake grows, Shelby knows she has to plow through the clues to weed out the true killer and save her friend. I was just thinking it was about time for another book! And a county fair as a setting sounds so good for summer! Thanks for the chance to win! 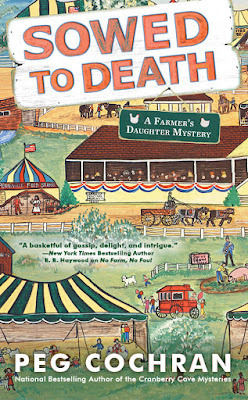 Sounds like a great cozy mystery. I can't wait to catch up Shelbu and the other characters in the new book. Thanks for the chance to win. Rootseller55 (at gmail .com). My love life is non-existant. Bob passed away 13 years ago. not sure I would have wanted to start over in a new life. years left anyway. Would love to read the book. I've been married for 30 years now---so I guess my love life is pretty darn good. That's quite a collection of potential suitors. Ummmm what's a love life? Some of us have been married or together long enough to have forgotten some of that stuff. I married my first husband twice (duh). Was single 13 years. But finally met my soul mate 21 years ago. This sounds like another fun series! Getting down to the end of the month and I haven't won yet but I have had a blast checking out all of these great authors and series. Thanks for the chance to win. I am blessed that my love life is very affectionate. My love life is nonexistent. At my age most men are married, gay, or divorced with too much baggage. Sigh. I have to read romance and mysteries with romance to keep up with theory and live vicariously. sounds really good..would love to read..thanks for chance. No love life here but at 70++++++ I'm fine with that! Thanks for the giveaway - sounds terrific. My love life is alive and kicking. I am new to this series. A great opportunity thank you. Sounds like a great summer read. Great cover. Can't wait to read. My love life is great! This sounds like a great story. My love life is great! I have the man of my dreams (for 34+ years) by my side through thick and thin, when healthy and otherwise always there to walk side by side or to lean on when needed. He’s my best friend, my lover, by co-chef, my happy in happily ever after. We have been through a lot including the passing of our only child and being full-time caregiver to Mom from cancer surgery and Alzheimer that have only brought us closer together stronger than ever. Love that man and nothing brings me greater joy than to make him happy. 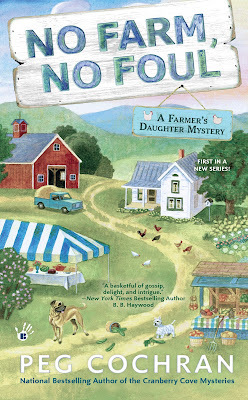 I just finished reading No Farm, No Foul and enjoyed it a lot. I'd love to read more of the series. And my love life is pretty sweet - married for 28 years, getting better all the time. Three to choose from and I am betting on the brother-in-law! And recipes too! Can hardly wait to read it! This series sounds great; never read any before. Thanks so much for the giveaway. This series sounds so enjoyable. Thanks for the chance to win and to answer your question, I have been very blessed in my love life. 48+ years of marriage to one man and I still like him as well as love him! This series looks great! Thank you so much for the chance to win! Our County fair is next week. Sounds like a great read. Thanks for this opportunity.